Well... Maybe the house isn't new but here are some pics of our house put back together. I'm pretty thankful for all our friends here in town that have taken care of us in this time. Thank you so much for all you did for us church! We love you. So you can see that Sophie already made some messes here but we love her! The living room, hallway and dining room used to Pergo (type) laminate flooring. The kitchen was tile but we decided to tear it all up to match the kitchen and dining room. We did carpet in the living room and hallway to make the house more kid friendly (I mean in March 2010 we are going to have two kids!). So that is what is going on with the house! In January 2006, after being married for a year, Charity and I decided that we needed a dog. Actually, I may have been the one to decide that! Our friends The Rock's dog just had puppies and they gave us one! We wanted a girl and sure enough there was only one girl: we named her Rosarita or Rosie for short. Rosie was kinda like our baby for a long time. We took her everywhere! Well, almost everywhere. We took her to Utah with us on a trip one time, she went to So Cal but never made it anywhere overseas. She loved to sit on my lap in the car and put her head out the window. She didn't what to do when it rained because she was not a fan of the water and when it snowed her she was shocked! The Sophie came and Sophie loved Rosie! When we first brought Sophie home Rosie was a little protector of her and it was so rad! About a month ago Rosie bite Sophie in the face. I was pretty bummed but told myself because she didn't break the skin that it was ok. I also tried to rationalize it that because we had been gone so much this summer she was just getting re-established in our home. Later that week Rosie tried to snip at Sophie again; I was super bummed. It was a Saturday and I just cried for about 3 minutes. I was planning on taking Rosie to the pound but just couldn't do it. Then when our house had water damage I needed to take Rosie to our friends The Rock's house. While Rosie was there I asked Nancy if she would find Rosie a new home. So Rosie has a new home now. She has been there about two weeks and we miss her. I miss her eating everything that Sophie drops on the ground. I miss taking her for walks and I just miss my dog. I know I made the right choice but so many times in life the right choice is so hard to make! So Summer Camp was great and the bus ride home was not too shabby but when I came home that was a different story. We used to have Pergo flooring in our; dinning room, living room and hallway (key word is "used" to). When I came from camp I found out that our A/C condensate line was clogged and decided to leak on the floor. I was pretty bummed but we have rad friends with a construction company that totally took care of us. 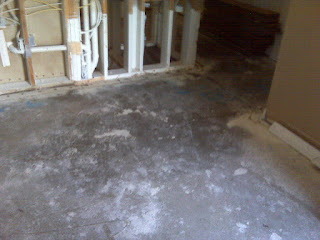 This is what our place looked like when they had to tear out the walls and all the flooring. I really don't know what we would have done without our church; I am serious. Showcase came and did all the demo and fixed our house back to normal (we changed to carpet). Then our friends Mikey and Kristen let us stay with them; which was way better than the hotel. I am so stoked that we have friends who care. I really don't know how people do life without a church family. This afternoon we landed in Vegas coming home from vacation. When I came home to our house (that is finally put back together from being semi-flooded) I realized how much better I feel. Every year we take all our vacation time, yep you heard me right! I take all my vacation time every year. This year we have done some weekend trips to So Cal to see family but this time we went to Bend, Oregon to see one of my great friends Conrad and his wife Karen. We flew Allegiant Air and got a great deal on a direct flight to Bend/Redmond Airport. 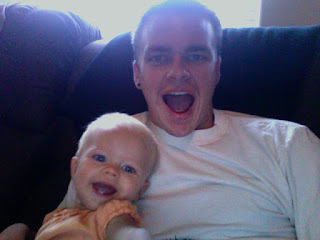 This vacation was different because this was our first family vacation with Sophie. Now we have taken those quick trips to see family but this was our first time really taking Sophie on vacation with us; and it was great! Sometimes I go on vacation and then I need a vacation from my vacation because it is so packed with stuff. This time we just relaxed. We; floated the Deschutes River, Feed the ducks, relaxed, ate great food, walked around Bend and just did some family time. When I go on vacation I am usually ten times too busy and sometimes I question leaving. I like to schedule my big vacation right after Summer Camp or a Mission Trip. I do that intentionally because I know that I am going to be super busy and this is a great time for me to get away and just get recharged. Yep, that is true. I almost always turn off my phone while I am on vacation. The message on my phone says something like this while I'm gone: "Hey you've reached Neal and I'm on vacation from (insert dates). If you need anything related to South Hills please call Amy Robledo at 702-616-6700. If this is a personal message I will get back to you when I get some time. Thanks for the call and have a great day". Also, I don't check email and I know that it will be there when I get back. It is so nice to be away from electronics on vacation; I need that. And my family needs time with me. I am currently taking a half load in seminary and working full-time. That means I don't get to spend the time with my family that I would like to spend. When I get time to spend with my girls I realize how much I need it! I need time holding my daughter and throwing her up in the air. I need time walking with Charity and getting coffee. I need vacation time to connect with my family and make sure they are doing ok. I need time with my family. I want to make sure that my priorities reflect how important my family is to me and if I don't take vacation that shows my family they are not that important. I often think thinks like: "I don't have time for this" or "Man, I have so much work to do". When I get away I realize that my job goes on without me. When I leave I actually come back more refreshed! Yep, you heard me right; I come back more refreshed! I come home and I am ready to dream again. I get the sleep that I have been missing. I get the kisses from Charity that I love and I get to hug my little girl. That makes me happy and I need that. I am currently writing my final paper for one of my summer classes "Christian Spiritual Formation". I was going through my notes and just found this so helpful during the course that I needed to share it. 2) Renounce the lie: you have worth! This last week has been super crazy! From coming home to a clogged AC drain to getting out of our house to doing a wedding to family in town to speaking at church on Sunday: our week has been full! If you have kids you know that full weeks= craziness and craziness= jacked up schedules. Sophie had been off her "normal" schedule since Friday and it was no fun but that changed today. Sophie woke up from her nap a little early and I took her to visit Gilbert at his work (if you ride dirt bikes you gotta check out Red Seven). It was so rad to have some me and Sophie time. I was a little scared cause I forget everything you need to take a baby out; literally everything! After we got home Charity took Sophie swimming while I did some homework and then Sophie and I played with Photobooth on my comp. Here is my favorite picture that we took. I love this stage that Sophie is in and just have so much fun hanging out with her. Thank you Jesus for my daughter.